I was skimming through granola bar recipes online and rejecting most for having ingredients I didn’t want (mostly too much sugar) or can’t easily get here in the UK (if you want sugar-free applesauce here you have to make it yourself and I didn’t feel like it today), when I finally found one that was close to what I was looking for: Fannetastic Food’s Oatmeal Dark Chocolate Granola Bars. But since I still didn’t want everything there and wanted to add other nuts and seeds, plus only had a 9×13 inch pan, I ended up changing a lot of the recipe. I’m going to post what I actually made here so I have it for reference later, because the result is a chewy, oaty bar with a good amount of chocolate, nuts, and seeds. These will do very nicely for busy days out to prevent low blood sugar between meals. As I understand it, we food bloggers are now supposed to stack foods for photos. 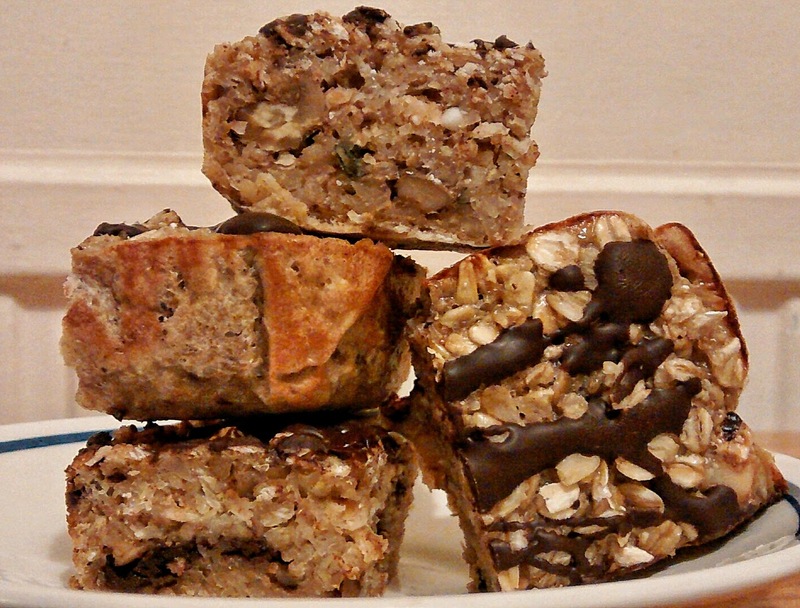 A relatively low-sugar, thick, moist, oaty bar-cookie with chunks of chocolate, nuts, and seeds. Swap out ingredients for what you like or have on hand. Preheat oven to 375 F, 190 C (180 Fan). Prepare a 9x13 pan with parchment non-stick baking paper. Tip: tear off about 18 inches of paper, turn your pan upside down, and fold the edges of the paper against the underside of your pan so it matches that bottom rectangle. Put the pan upright and drop the folded paper in. Unfold the edges of the paper against the edges of the pan, folding the corner triangles against the sides. In a large mixing bowl, combine the oats, flour, walnuts, macadamia nuts, sunflower seeds, pumpkin seeds, chopped chocolate, sugar, nutmeg, and salt. In a separate bowl, lightly beat the eggs into the milk. Add the vanilla and mix. Pour the wet mixture into the dry mixture and combine thoroughly. The milk will look very wet around the oats. Pour the entire mixture into the prepared pan and smooth out with a spatula, then give a little shake to ensure the liquid is evenly distributed. Sprinkle on the additional oats, if using. Bake for 30-35 minutes or until it feels firm with a crusty top in the middle and the outer edges are turning brown. If your oven doesn't cook evenly, be sure to rotate the pan around halfway through cooking. Allow to cool in the pan for about 10 minutes. Remove from the pan and place on a large cutting board. Melt the additional chocolate (if using) in the microwave using very short bursts until it is partially melted with lumps remaining. Mix gently with a silicone spatula for a few minutes until lumps melt. Use the spatula to drizzle the chocolate over the whole thing. Cool until the chocolate on top solidifies (which might take a long time, so you may need to pop it in the fridge). Cut into bars of desired size. I plan to freeze most of what I made today for upcoming days out in the lovely English spring weather! This entry was posted in Bar Cookies, Links, My Recipes, Other People's Recipes. Bookmark the permalink. I baked an oatmeal cookies without different nuts. The sweetness was balance i.e., not too sweet. It really taste good. Made these and they came out great! I used what was in my cupboards, which was a mix of walnuts, sliced almonds, pumpkins seeds, and a handful of flax seeds.